The Pheasant Cuckoo is one of Tropical America’s most intriguing birds, with its long, full, tapering tail, small head, distinct call and odd behaviors. Widespread in forest habitat in Central and South America, this medium-sized cuckoo, 40 cm in length, has a rather unusual profile with its small head with a short, pointed crest and thin neck. It is overall brown above, each feather edged in white, and creamy white below with a band of brownish spotting across buffy chest. It has a narrow, whitish postocular stripe and a chestnut-rufous cap. Its tail is long, wide and graduated, the upper tail coverts are greatly elongated, adding fullness and a “bushiness” to the tail. The tail is brown with a white tip on each feather, adding to its elegance. It has a very muscular body, especially in the tail region. Legs are thin and weak. Pheasant Cuckoos inhabit lowland tropical forest, and can be found in dense thickets, secondary growth forest and borders up to 1200 meters. Rarely seen, they are vocal and are often heard. Their call is similar to that of Striped Cuckoo, two clear notes followed by a quavering third note or sequence of two or three quick short notes. They call ventriloquially from branches in the lower and middle levels of the forest, in dense cover, and are often difficult to detect. In Panama, they call most frequently from mid-April to July, during the onset of the wet season. Pheasant Cuckoos also have some other interesting behaviors. Males are territorial, and in response to singing males, they will raise their head and crest, puff out their breast feathers, partially extend their wings and arch their tail coverts. Even more interesting, the Pheasant Cuckoo has a unique, stylized foraging behavior. It descends to the ground, walks in the leaf litter and produces rattling sounds by vibrating its wings, body and tail feathers, as well as bill clapping. It bobs its body then lunges forward, taking several short steps, picking at insects among the leaf litter. It feeds on arthropods and small vertebrates such as lizards. It is also known to eat small nestling birds. When it comes to reproduction, like many other cuckoos, the Pheasant Cuckoo is brood parasitic, depositing its eggs in the nests of other bird species. While not much is known about its specific parasitic behavior, it chooses to lay its eggs in cup nests (although possibly in closed nests as well). The nests of several species of flycatchers have been documented with Pheasant Cuckoo eggs present, including Yellow-olive Flycatcher, Eye-ringed Flatbill and Pied Water-Tyrant. Eggs are faintly buff, non-glossy with irregular rufous spotting, more concentrated in a wreath around the larger end. The female deposits the egg into the nest, and from there, parental care is provided by the host species. 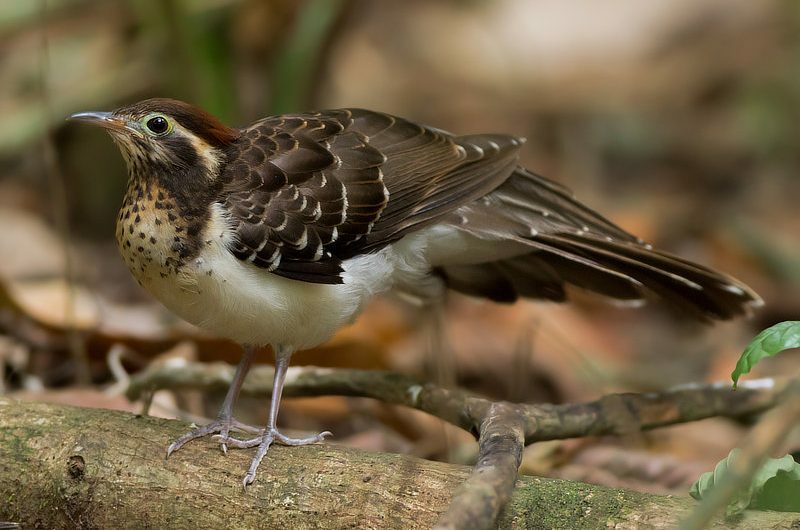 The Pheasant Cuckoo ranges from southern Mexico to Argentina, throughout forested regions of Central America and the middle and southern Amazon basin. In Panama, the Pheasant Cuckoo can be found along the Pacific slope and Canal area. Uncommon and local, its true distribution is not well known due to its highly secretive behaviors.